All MopTop products are sulfate-free and color-safe. The primary culprit for color-stripping is sulfate-based shampoos. Sulfates are detergents that strip hair. 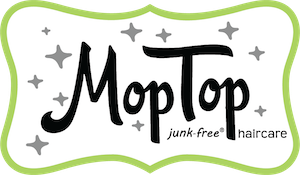 MopTop products are sulfate-free. Other color-stripping culprits – heating tools (hairdryer, curling iron, flat iron), hot water, and over-washing. For best results, deep condition hair prior to applying color and again afterward. The lack of sulfates in our products helps maintain your color even longer so you can enjoy all the colors of the rainbow!